Featured On... Hostess with the Mostess! We are so excited to see our styled Engagement Party shoot up on Hostess with the Mostess today! They are actually announcing a revamp of their blog today- starting with our shoot! The blog is now focusing directly on it's readers and making the wonderful world of parties more accessible! HWTM will not only give you tons of fun ideas for your next event, but they'll be posting more and more DIY's so you can actually recreate all the lovely things you see! So when they asked us to make a DIY for our plexiglass signs, we were all for it! These signs are seriously so easy to make, and really make an impact. They photograph great and really give a unique look to your party! Plus, it's super easy to erase what you've written (just a little Windex & paper towels do the trick) just incase you make a mistake. Featured In.. Ireland's Wedding Journal Magazine! The Autumn issue of Ireland's Wedding Journal Magazine is on stands now, and we're in it! 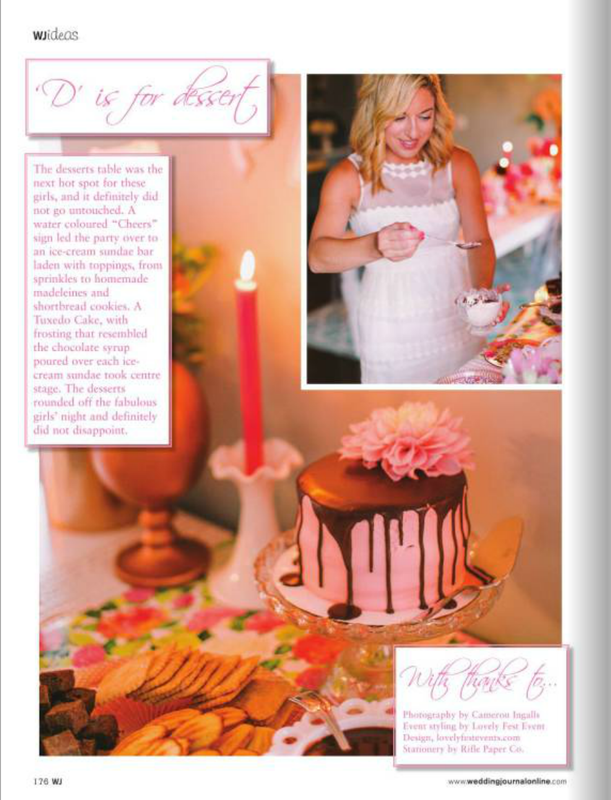 We are so thrilled to share that our Bridesmaid Dinner Party shoot is in yet another international magazine! We hope this shoot brings inspiration to Irish brides and future brides throughout the globe. We absolutely loved styling this shoot (some of our girlfriends actually modeled in it with us!) but to be honest we never thought it'd get this far. Except for the fact that Cameron Ingalls shot this for us, and everything he does is gold! From features in The Wedding Standard Ezine, to Style Me Pretty, to the British magazine Mollie Makes, and now in an Irish magazine? We are so excited that it has taken off and that all kinds of people can appreciate it around the world! If you happen to be in Ireland, or any other European country, pick one up for us! 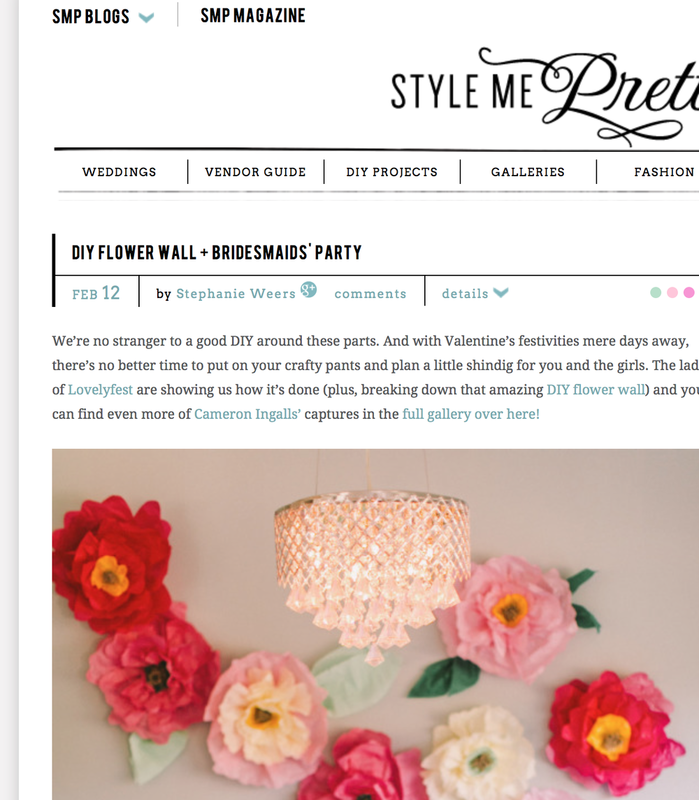 Style Me Pretty Valentine's Week Feature! We were thrilled when the ladies of Style Me Pretty told us they were going to feature our Bridesmaid Dinner Party styled shoot on the front page of their blog! This is one of our favorite wedding blogs, ever! There's so much inspiration to be found on this site, from engagements to weddings and everything in between, and we are so humbled to be a part! We wanted this styled shoot to really feel like a fun dinner party with girlfriends, so that's exactly what we made it! The photographer, models, bartender, and caterer are all special people and close friends of ours, which just put this shoot on another level! We were actually both in the shoot as well and got to eat, drink, and be merry just as if it was a real bridesmaid dinner party! Thanks for checking it out and be sure to click the link to see a fun DIY for the flower wall! And if you're not up for a DIY project, the flowers are also for sale in our Etsy Shop! We think there's two very important questions involved in planning a wedding: "Will you marry me?" and "Will you be my bridesmaid?" For those of us who have gotten married, we know that this can sometimes be a painstaking activity, since you don't want to leave anyone out! This is where the bridesmaid dinner party comes in- where a bride can ask her best friends to stand beside her on her big day and then eat drink and be merry! This shoot is how we'd throw our own bridesmaids a dinner party! Each girl was asked the question with a beautiful Rifle Paper Co. card inside of a vintage lucite purse. We had such a blast being a part of it with our friends and the amazing photographer himself, Cameron Ingalls. The shoot is featured in the second issue E-Zine on Cameron's blog, The Wedding Standard. Check it out, there's tons of great styled shoots and real weddings in there full of great inspiration!